We analyze your current situation in the destination country and, if needed, we advise you about the best legal way of settling in the country: through an individual employee, an agent, a branch office, a subsidiary company or a joint venture agreement. We make a study about the tax implications of the activity in the destination country as well as the ones in the parent company. If possible and necessary, we develop a financial plan and a financial profitability assessment of the foreign establishment project. We carry out the juridical opening of a subsidiary or a branch, at customer discretion, and we face for that all the involved areas in such process, like the legal, commercial, accounting, tax, labour and the financial one. Once the juridical opening of the subsidiary is done, we make sure that all its back office processes (accounting, tax, labour, reporting and transfer prices) are perfectly established and completely coordinated with the parent company in order to have an efficient operating capacity. We implement a financial management control between the parent company and the subsidiary that guarantees reliable and useful information reports for decision making. We transfer all the knowledge and processes to your accounting department to make it to assume all the control. But if you think it is necessary or suitable, we can also carry out an annual internal audit, and follow up in that way your subsidiary activity. We can also help you in other practical aspects of the foreign establishment process, such as the office location search in the destination country, commercial studies or specific recruitment. 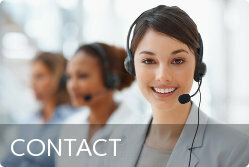 We save time for you and your accounting/financial department. The juridical opening of a foreign subsidiary company can become a long and laborious investigation work in different areas, which involves a lot of time and energy, and maybe these are not available in your company at this moment. In business, time saving means productivity. That fact ,in a long term, can avoid unnecessary fixed resources hiring. You and your accounting department can focus on daily operations already generating cash. We give you security and efficiency in your establishment abroad. By contracting our project you make sure that at the end of the process you will have a definitive establishment in the destination country, where all your back office areas will be ready to work in a coordinate and efficient way. Subsidiary company accounting design and implementation. 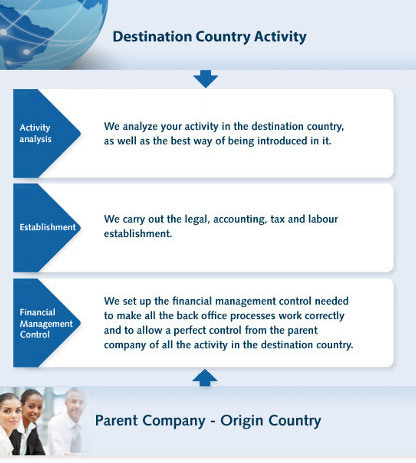 Compatibilization of the chart of accounts and its structure in the destination country with the origin country needs. Design of a reporting system with a real added value for decision making. Focusing specially in business key variables, the company areas, the methodology, the support and the production frequency. Subsidiary companies budget control implementation. Budget assessment and calculation, as well as reporting system design. Subsidiary cost model design and implementation. Cost accounting. Enterprise Resource Planning (ERP) financial implementation in the subsidiary. Currency exchange differences analysis and risk hedging proposal with financial instruments. Transfer prices analysis between subsidiary companies and parent company. Transfer prices current legislation compliance. Internal audits for the international subsidiaries. General or by areas. Subsidiaries tax, legal, labour and accounting obligations compliance management. Economical and financial studies to evaluate corporate projects affecting international subsidiaries, and its execution. Mergers, acquisitions, investments or divestments and joint ventures. Obtaining financing, subsidies and incentives for international subsidiaries. 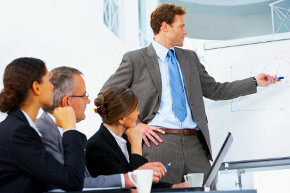 Preparation of specific documentation, business plans and financial plans. Subsidiary company financial or back office staff recruitment.